Stay up-to-date regarding human athlete and horse athlete anti-doping in accordance with current ASADA/WADA and FEI/APVMA rules and recommendations. It is imperative that athletes are familiar with the anti-doping policy and comply accordingly. The courses are free and available to everyone. The Australian Sports Anti-Doping Authority (ASADA) is Australia’s driving force for pure performance in sport and aims to protect Australia’s sporting integrity through the elimination of doping. Brought to you by our sponsor Pryde's EasiFeed, discover our Nutrition Hub and read more about feeding topics, understanding the basics, control weight gain and topline, equine ailment issues, nutrients, discipline related feeding and watch the exclusive Nutrition Video Series. On this page, you will find all the resources around Making Equestrian Safer. The Australian Government 'Play by the Rules' program provides information, resources, tools and free online training to increase the capacity and capability of administrators, coaches, officials, players, parents and spectators to assist them in preventing and dealing with discrimination, harassment, child safety, inclusion and integrity issues in sport. Equestrian Australia wants to boost the awareness of common issues that arise in the sporting community where there is currently a lack of information and education provided around mental health. Find out more on this page. Equestrian Australia (EA) takes very seriously its responsibility to deliver a safe and welcoming sporting environment that is caring, nurturing and safe for children. FEI Campus, get e-learning anytime, anywhere! 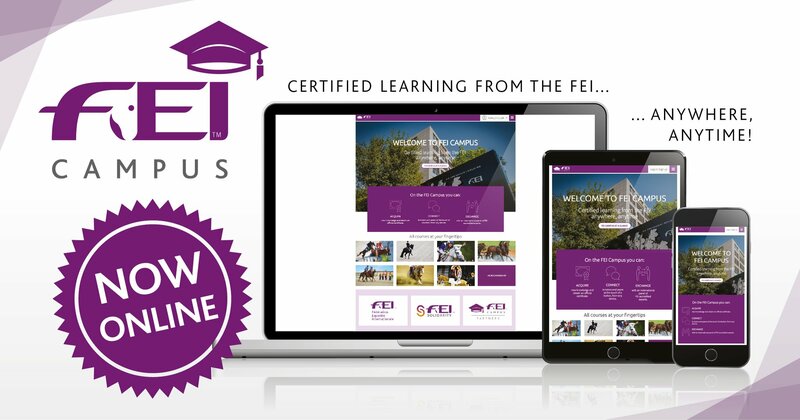 FEI Campus is a unique and free e-learning gateway for everyone with a love of horses and equestrian sport, wherever they are in the world. The content and courses have been carefully crafted by equestrian experts and are designed for everyone, including those looking for invaluable horse training and stable management tips to educational programmes on veterinary needs, equine behaviour and also for judging certification. The platform is designed to give the equestrian community an immersive experience, with all courses and connection with tutors and peers just a click away from any device. FEI Campus will be constantly enriched with up-to-the-minute and wide-ranging information to reflect the global interests of the rapidly growing international equestrian community.